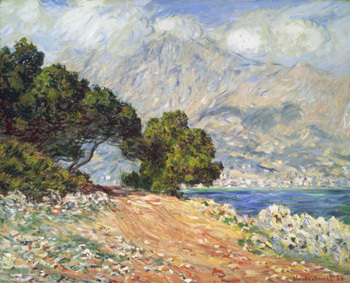 This is an 1884 painting by Claude Monet: Cap Martin, near Menton. It's currently on display in Wellington as part of the "Colour and Light" exhibition from the Museum of Fine Arts in Boston. When I went to this French coast, I was struck by its resemblance to part of the Wellington coast, especially the piece that runs along beneath the Massey memorial, looking back to the city. I didn't know about the memorial and the path up to it until Harvey showed it to me. By that time we'd already been to the coast Monet painted. Walking up the path and seeing the intensely blue-green sea through the trees, I thought that when Katharine Mansfield first went to Menton in 1920, three years before her death, perhaps she took comfort from this resemblance. She wrote some of her finest stories there. PS: I had forgotten that the last post Harvey wrote for his blog, Stoatspring, on 22 December 2010 was about Katherine Mansfield. You can read it here. I came across it when I was looking at his blog today. Stoatspring has been chosen to feature in a new exhibition on diaries, opening at the Alexander Turnbull Library on Monday. Walking up to the Massey Memorial is one of my most enduring childhood memories. We lived in Hataitai so, once we'd got a car, we used to go there often, especially when we had out-of-town visitors.